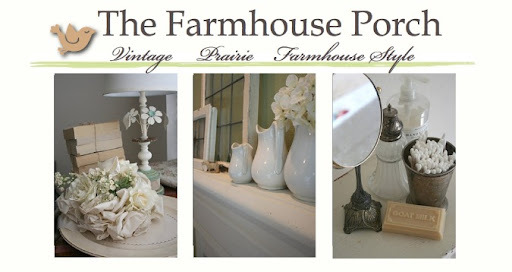 The Farmhouse Porch: A Hutch from a local museum, a new painting and a thrift store lamp that refused to be left behind. A Hutch from a local museum, a new painting and a thrift store lamp that refused to be left behind. About once a week I glance at craigslist. Last week I found this hutch. I couldn't believe how adorable it was. It had JUST posted. I think it would have been gone in a heartbeat...the price was LOW. And it is actually two pieces, the bottom piece has a carved East lake backsplash on top that is SOO cool. But until I can find a way to mount the top shelving unit on the wall above it, it will have to stay hidden. This hutch came out of a local museum! It was built/bought by an early Tomball,TX homesteader. This room is still in progress. I STILL have things sitting around waiting to go up, including a window treatment, a huge light fixture that looks like an old metal basket, and an old sign. Hopefully soon I'll have a finished room post to share. Another "thrifty" item I bought recently was this old little glass lamp. I had seen it at the thrift store many times, hidden on some shelves up high. It was $12, which I don't consider thrifty at all. But they say when you leave something and keep thinking about it, and keep returning to it, it is probably meant to be yours. I'm so glad I did. I popped in a 15w bulb and tucked her into the corner of this desk in the living room for a soft glow. It's perfect at night. And lastly here is today's painting... "Dusk from the Porch". 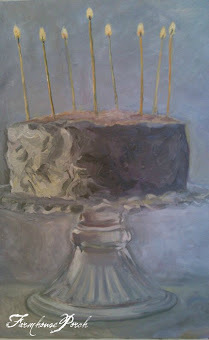 It was actually a more abstract piece and when I finished it, I hated it. I reworked it this morning. What an amazing hutch.LOVE it.Just my style.Looks great with your ironstone too.What a sweet lamp.Beautiful painting! It's always so frustrating to work on something and not get the gratification you were hoping for. You are very talented, Linsey. I'd definitely buy your work, it's beautiful. The ones on the side bar are gorgeous! I'm loving the vintage shoes and all your ironstone. I have a cabinet in the garage with old wavy glass- the cabinet isn't much to look at yet, but the glass made it valuable and special. The cabinet with the ironstone is lovely. So is the lady like lamp. What amazing treasures you have found! That chest is so awesome, I adore it. You know around here a lamp like that at a thrift store $12 would be a steal. Our thrift stores are too pricey, it's true. Oh, that hutch is beautiful! Lucky you to find it right when it was posted, and for a good price too! And I love your painting too! I like abstract/impressionist landscapes like that. The beautiful colors in your painting look like spring to me! I LOVE your old cupboard! I almost bought a similar cupboard this winter, but it was in really bad shape and would have required major reworking. 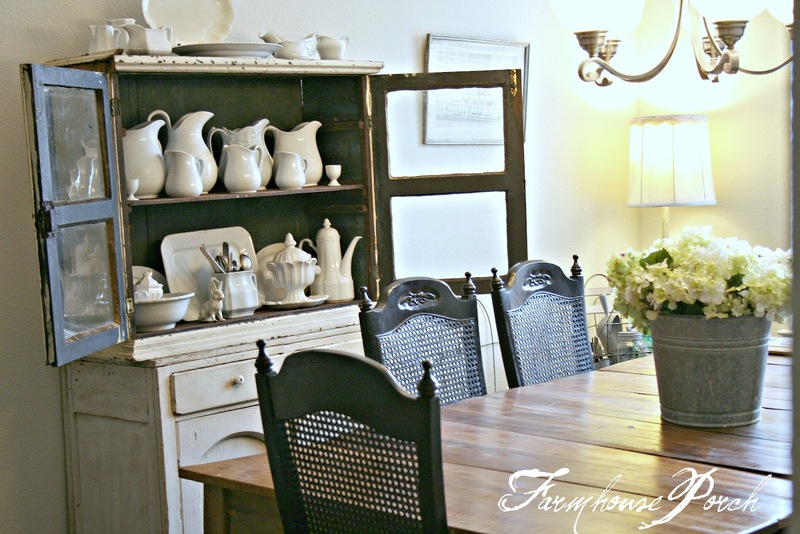 Love your charming hutch with your wonderful collection of ironstone. Your displays are just perfect. Love them. Such a cute little lamp which would be a steal at $12 where I live. And, you are a very talented artist! I love that lamp--I would have gotten it for $12 for sure! Your painting is lovely. Wow, I love everything! I love the way you displayed all your items! Linsey LOVE your new hutch lady! That is a beyond fabulous find! Gorgeous hutch....love the lamp! Yep, if you leave it often enough and it's still there when you go back it's definitely meant to be yours! 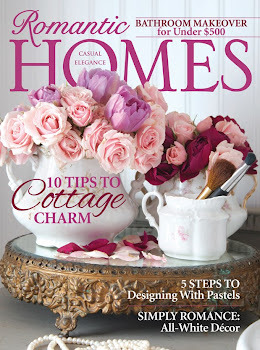 Oh, oh, oh, I am so in love with the ironstone pitcher collection in the cool hutch. I have one (pitcher collection) as well and enjoy it even more every time I look at it. I am crazy jealous over your new hutch - it is SO cute!! What a fabulous hutch!! 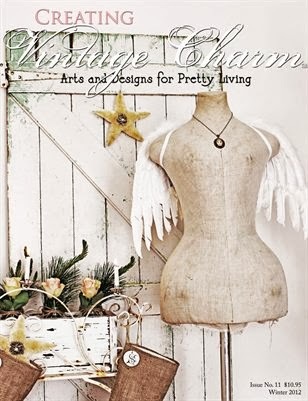 It is so perfectly worn:) Love it with your ironstone collection. Love your painting too....so pretty. what a special talent to have. Wow! I'll take that when your done with it! Lucky girl! Love it all! The hutch was meant to be yours, as well as the lamp. I love abstract & modern art with antiques! It adds that bit of surprise and contrast. That hutch is amazing! Great find. And I love the shelf and the lamp. You have such a flair for decorating. 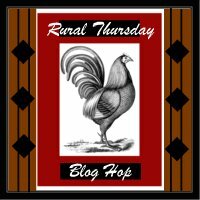 Thanks so much for sharing at Rural Thursdays! Ooo la la I love it all! Found you via French Country Cottage. Following now! Stop by Junkaholics Unanimous and visit sometime. Found you through Miss Mustard Seed. Love! the hutch. So much "personality"!!! And a lovely post at that! That hutch is perfection! 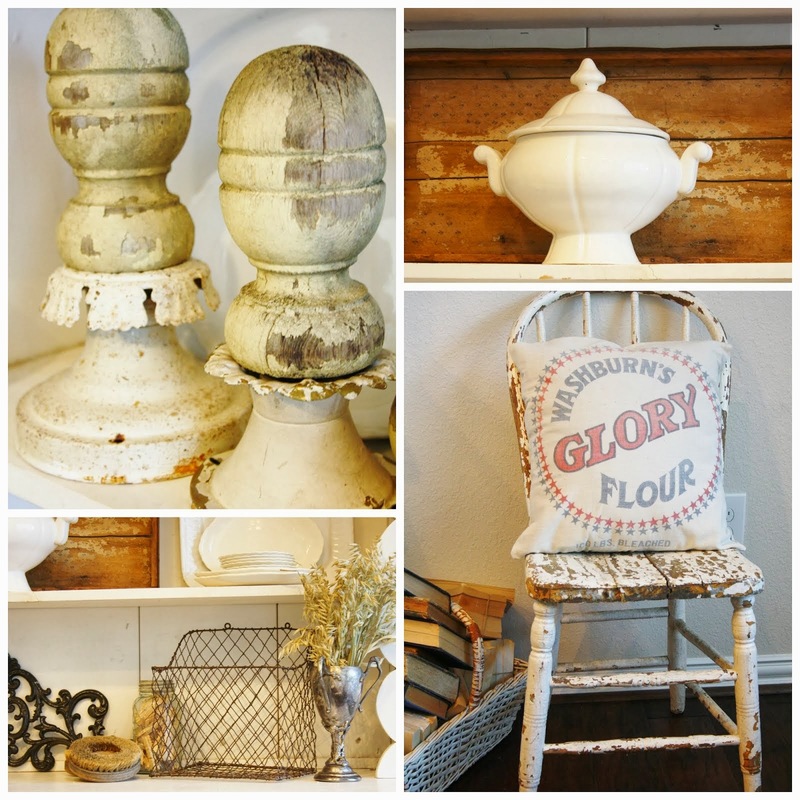 There is nothing quite like a collection of ironstone. Your hutch is a great find. I love the things we can find on CL. Thanks for sharing. I love the hutch. It has the perfect size and patina for all the iron stone. Looks great with your farm table, too. 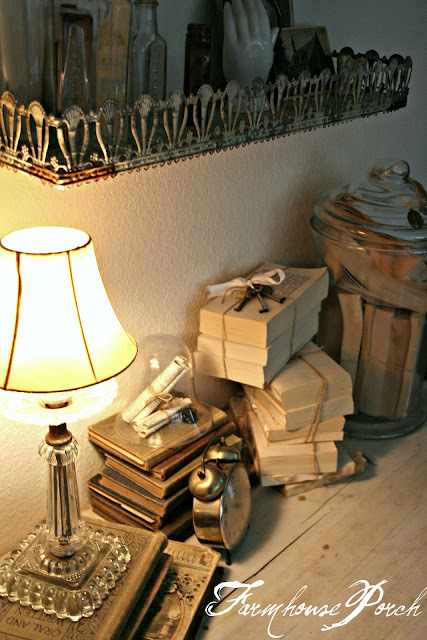 That little lamp-- SOooo worth $12!! I think you did well to purchase. Your hutch is lovely...what a great find!Stopping by from Metamorphosis Monday. Hello from your neighbor at Met Monday. I love the hutch and especially the ironstone china. P.S. Did you ever send me your info for my giveaway you won???? Wow! Awesome finds and a great painting too! 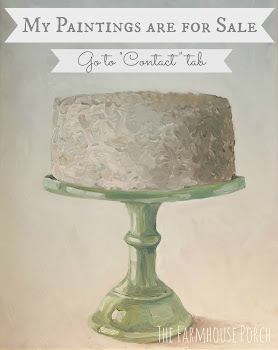 Thanks so much for linking up at Etcetorize. You gave that hutch a nice safe place to call home! Turned out great! What a conversation piece it will be. The hutch is amazing. I really must start shopping with you. Perfectly imperfect pieces are the best. Love the hutch with all it's chippy splendor. It's a WONDEFUL hutch! Nice that you got a good price. Perfect chippiness! And that is a darling little lamp. OMGoodness that hutch is gorgeous and love your collection of ironstone...beautifully displayed!! Oh that's an amazing hutch. Love all the ironstone inside. 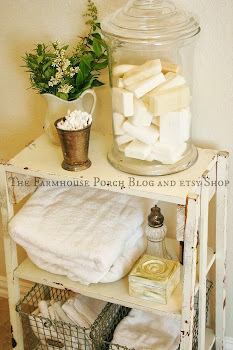 Such a neat old hutch...and loved all the treasures in it, too! I think my Mom had lamps like that, love it....wish I had nerve enough to get on Craigs list...maybe someday!! Great hutch. I love all the things you tucked inside. I clicked on your Pinterest link and OMG ... you have the best pin boards ever! !